If you grew up anywhere near a coast, you have probably cultivated a healthy fear of jellyfish: those wispy, tentacled creatures that deliver sometimes-deadly stings. Most of us have a very concrete mental picture of what jellyfish look like. They have mushroom-cap tops and long, trailing tentacles, right? According to the Monterey Bay Aquarium Research Institute, there is technically no such thing as a “jellyfish.” The creatures we identify as jellies are related to many, many more lifeforms than any of us realize. Two-thirds of the Earth’s surface is covered in water. There are untold numbers of undiscovered life forms in the darkest depths of the ocean, many of which are so alien and bizarre that we might not even recognize them as Earth creatures. Given this enormous diversity, it does seem that classifying all of these creatures into narrow groups might be difficult. 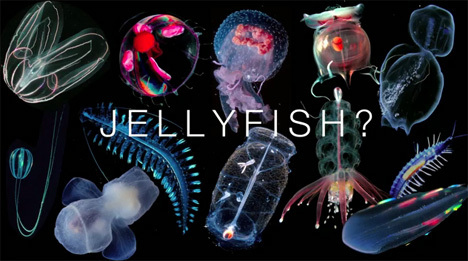 Still, none of us will stop using the term “jellyfish” anytime soon. See more in Earth & Nature or under Science. June, 2011.